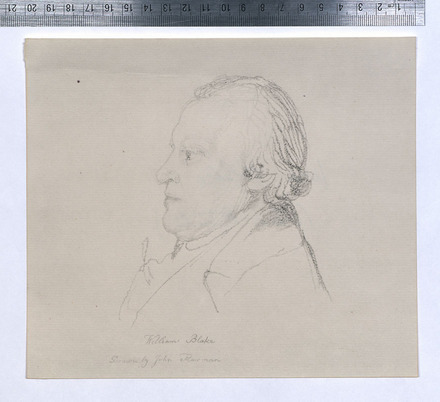 One day in 1802, William Blake (1757-1827) sat for his colleague John Flaxman (1755-1826) to have his portrait drawn. 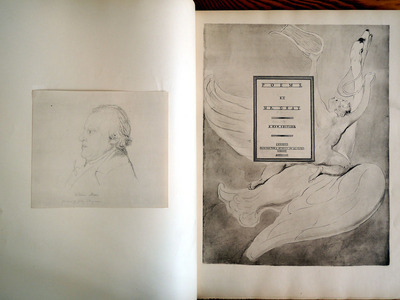 Flaxman’s final drawing is now located in the Yale Center for British Art, B1992.8.11(59). For a few minutes this week, we though we might have found a second drawing. It would not be uncommon for an artist to make several versions of a portrait, especially if it were for another artist who needed to approve the work. The signature matched; the size, the drawn line, even the chain lines were as they should be. We shared our good fortune with colleagues at the Blake archive, hoping they might tell us they had been waiting and searching for this drawing to turn up. What they told us was to look closely at the graphite. Sure enough, when we magnified the lines of the drawing it became clear we had a collotype reproduction of the Yale drawing. Further research led us to Blake’s designs for Gray’s poems, a large volume of facsimiles of Blake watercolors produced in 1922. 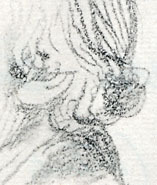 Tiny marks on the surface of a page indicated that someone had removed the facsimile of the Flaxman drawing originally tipped into the volume. At least the portrait is back where it belongs.